– drive ~1hr from Devonport if you’ve caught the Spirit of Tasmania over (assuming you don’t stop for breakfast on the way). If you find yourself a bit hungry once you’re in town, Stillwater restaurant/cafe is a good place to go. Although if it’s dinner time you may want to call ahead to check if there’s a table free. It’s arguably the best place to eat in town. If you’re not hungry, then you may find a browse through the Mill Providore and Gallery above it is also worthwhile. Besides interesting treats, they have lots of handmade Tasmanian crafts. A perfect place to browse for novel gifts should you need to buy something for family/friends back at home. 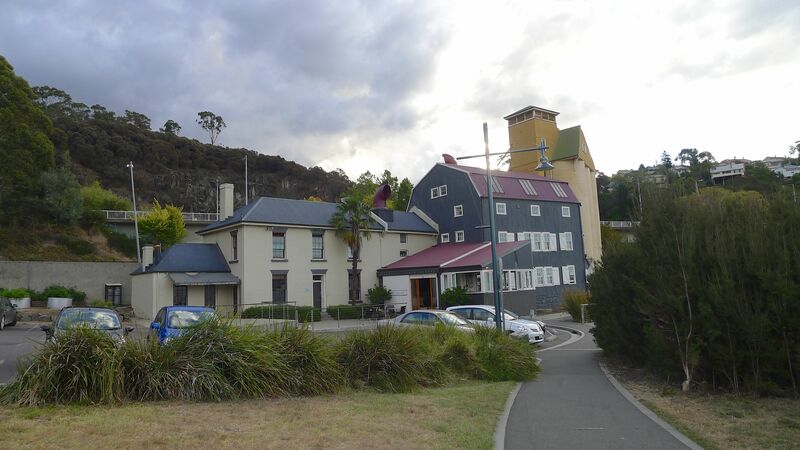 The old Mill is situated at the mouth of Cataract Gorge, which is definitely worth checking out. You can walk along both sides of the gorge and do a circuit back to where you’ve parked. There is another better place to park if you want to walk around though – at the end of Basin Road. That’s also where you will find the chair lift that boasts having the world’s longest single span (for a chair lift) – although there’s also a pedestrian bridge not far from the chair lift, should you prefer cross that way. I can’t say that I’ve spent much time shopping in Launceston (apart from a couple of the outdoor/hiking shops) but one place we seem to visit each time we’re there is the Design Tasmania Centre (previously Design Centre Tasmania). It’s located on Tamar Street which forms the western border of City Park, near the intersection with Brisbane Street. The shop is free to enter (breath deeply – the smell of huon pine is one that’s certainly growing on me), but I think you have to pay to see the exhibitions. It’s all very beautiful, and a lot is very funky and clever, though you definitely pay for the quality of the work. But something bought from there is a unique item that’s been crafted – in the truest sense of the word. As mentioned on my Hobart page, there is a Fullers Bookshop in Launceston; here you can pick up a copy of “A Walk in Old Launceston” with Charles Wooley & Michael Tatlow or walking guides, specialist Tasmanian books as well as other books you’ll find in mainland bookshops. The Queen Victoria Museum is interesting, if you have time. We haven’t been to the Art Gallery part yet, which is at a different location. If you’re into trams (that could be a Melburnian trait) there’s also a tramways museum/workshop right next door to the museum that’s worth having a look around while you’re there. The displays are quite good. 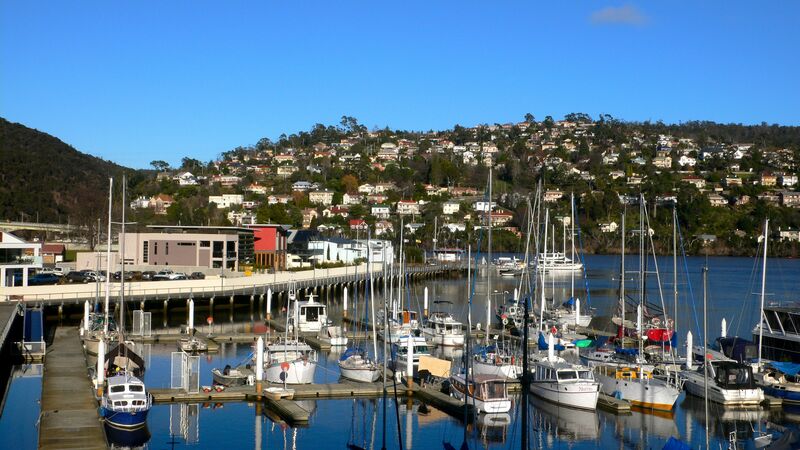 Of course, there’s plenty to see and do outside the main business area of Launceston. I think one of the main reasons that people visit the region is to do a wine tasting tour. Pinot and white wine varietals are the most popular grapes grown in the region. Even if you think you only drink Marlborough Sauvignon Blanc (Semillon), I reckon you’ll find something here to suit your palate. Check out Tamar Valley Winery Route, but if you’re not very familiar with wines from the region I’d strongly recommend joining a winery tour – that way everyone (over 18) can join in. If you’ve got a car, the road between Evandale and Relbia is lots of fun (even for a passenger). We found this great drive while looking for Josef Chromy Wines. It’s a very popular place to stop for lunch, with a lovely view across a dam to their vineyards – stunning in autumn with the leaves changing colour. The drive up to Low Head is also quite nice, but it’s not a touristy drive. We went up to see the lighthouse at the mouth of the Tamar River. Back in the day, when they sounded the foghorn it made the noise like that of a thousand elephants – it could be heard up to 32km (20 miles) away. 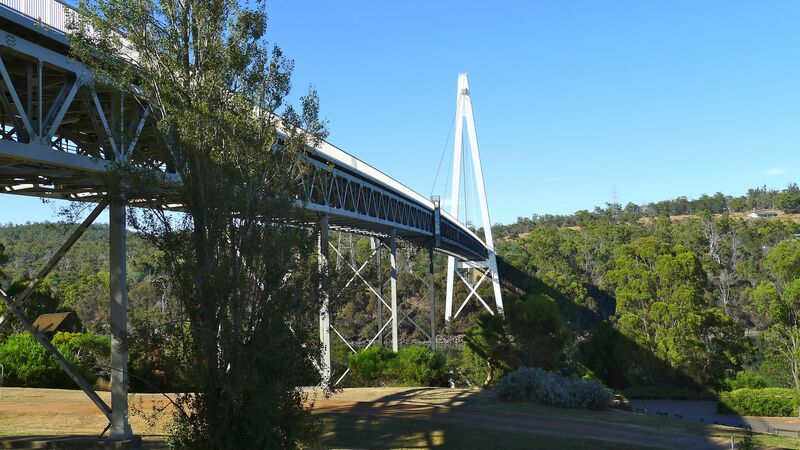 If you drive down either side of the Tamar River you’ll pass the turn off to the Batman Bridge, which is the only bridge crossing the Tamar River north of Launceston. It’s an impressive and lovely bridge. I could be biased. On the east side of the Tamar valley, there isn’t a coast road, but if you want to find a nice beach, I highly recommend Bridport. 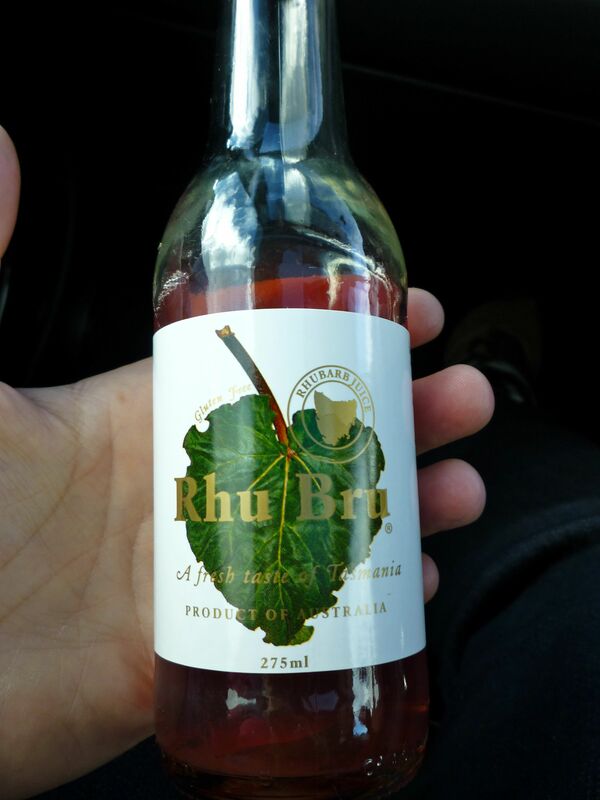 Scottsdale is south of Bridport, and home of the famous Rhu Bru. You can see fields of rhubarb as you drive into town, which is the key ingredient of the drink. Unfortunately we haven’t found this – or any of their other products – in Victoria yet. Other states are slightly more lucky. However, since there aren’t any factory or field tours to do with Rhu Bru, Scottsdale was more a point of note on our way to Bridestowe Lavender Farm before completing a loop back to Launceston. Please note that while their website promises “spectacular vistas during flowering in December and January” – don’t leave your visit too late in January because you might be as disappointed as we were. The Australia Day long weekend was past harvest time in 2012. What’s more, you can’t see the fields from the road or the drive way. It’s not until you’ve paid the entrance fee and driven up to the carpark before you know whether or not there fields are going to be like the photo on their website or not. Is it a bit rich to charge an entrance fee if you’ve already harvested 95% of the flowers that you’re charging people to see? If you want to combine a nice drive with a walk in a National Park, why not try Ben Lomond NP? It’s one of the state’s least frequented National Parks. We’ve done the circuit from Carr Villa (a scout’s hut) up to Legges Tor and back via the road (approx 12km, 4hrs). I was as sick as a dog for the one night we stayed here back in July 2009 (due to a cold/flu), so forgive me if I don’t remember too many details about it. It was nice looking at all the yachts just outside, and it wasn’t a long walk to Stillwater from there (10-15min?). The room seemed comfortable enough, though I think I probably could have slept anywhere that night. We’ve stayed here a couple of times. Nice rooms (bigger than usual and very comfortable), handy laundry (which we normally make good use of since we’ve been hiking) and decent, if slightly limited, parking. They have a small restaurant but we haven’t eaten there. In addition to Stillwater (which has great food, great location, and pretty good service), the owners run a steakhouse located closer to the middle of town called the Black Cow Bistro. The restaurant is in what used to be a butchers shop on the corner of George & Patterson Streets. It’s not a place for vegetarians. But it’s been done very well and is funky, not gory. The food, wine and service are great. We haven’t spent as much time in Launceston as we would have liked. There are other restaurants around George and Brisbane Streets (near Black Cow) that we noticed and thought looked good, but haven’t tried yet – simply due to lack of time. Sorry for disturbing you again. Actually I am doing some research about Launceston. My research almost completely done but just lacking some research about visitor who come with family. Can I know either this is a solo trip or you went to Launceston with your family. Feel happy if you come with your family as it make my research completely done. Thanks for the question – no bother at all! Stephen and I don’t have children, but I don’t let that put you off in any way. Most – if not all – of the places we visit are public attractions that welcome families. A walk in a National Park shouldn’t be out of the question either. It doesn’t have to be all the way up to Ben Lomond. Tamar Island is right in town (so to speak), has public facilities, it’s an easy stroll and also great for spotting wildlife (see more on this walk here or explore the full list of Tasmania’s Parks & Wildlife Service’s 60 Great Short Walks). Please let me know if I haven’t answered your question properly, or if you have any more I may be able to help out with. I hope you have a great holiday – bon voyage! Well, that teaches me for making assumptions! I can’t tell you what to or not to do, if you claim my family is my partner and myself I guess that depends how you define a family… But I can help point you in the direction of a ‘nuclear’ family (i.e. parents and children – who also had visiting grandparents) who visited Launceston from Melbourne. Glad I could help Hafis. All the best with your uni project.